Published: Oct 18, 2018 · Modified: Apr 11, 2019 · By Jen Sobjack · This post may contain affiliate links. 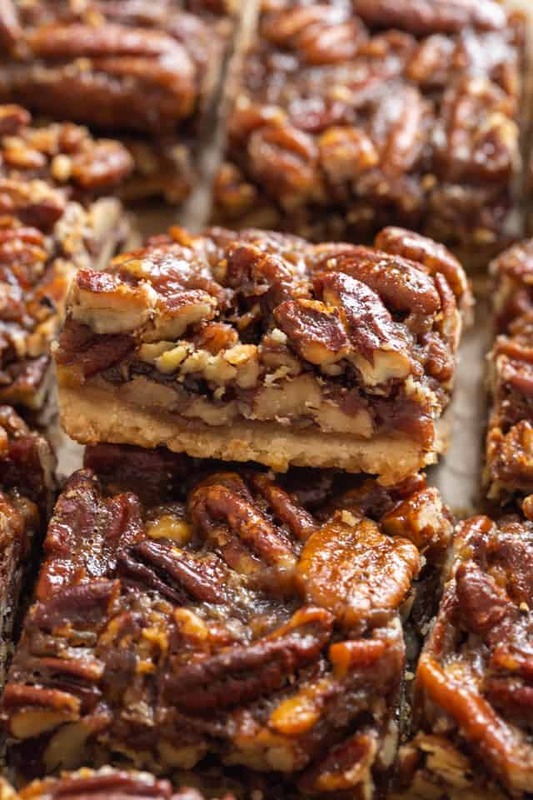 Crunchy, gooey pecan pie bars are a wonderful fall treat. A crisp shortbread crust gets topped with classic pecan pie filling for a simple and portable dessert. 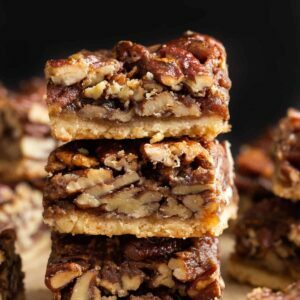 A long time ago I shared a recipe for chocolate bourbon pecan bars. 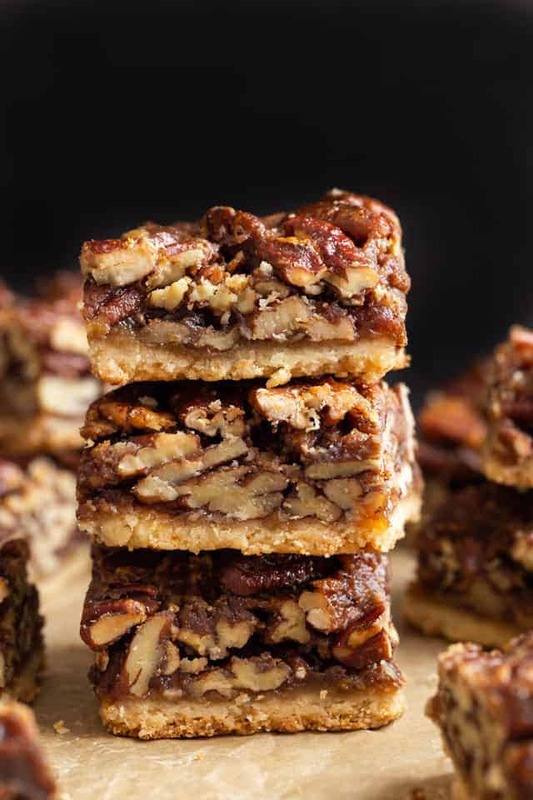 Today’s pecan pie bars are inspired by that old recipe. I revamped it slightly, omitting the chocolate in the crust and filling. I also adjusted the filling so it’s a bit more gooey like a pecan pie. I left the pecans whole instead of chopping them up and I used 4 cups of pecans. These bars are so crunchy and gooey. The edges bake up a bit crisper than the center. I prefer the middle pieces over the edges pieces. The crust is thick to support all the filling. I sprinkled a little brown sugar over the crust before baking it to create a crisp layer of caramelized sugar. It is best to refrigerate pecan pie bars after they’ve cooled. They will keep for up to 5 days stored in the refrigerator. These bars freeze well and they’ll keep for up to 3 months in the freezer. Thaw them overnight in the refrigerator before serving. The crust comes together easily! Just whisk all the dry ingredients together then stir in the melted butter. 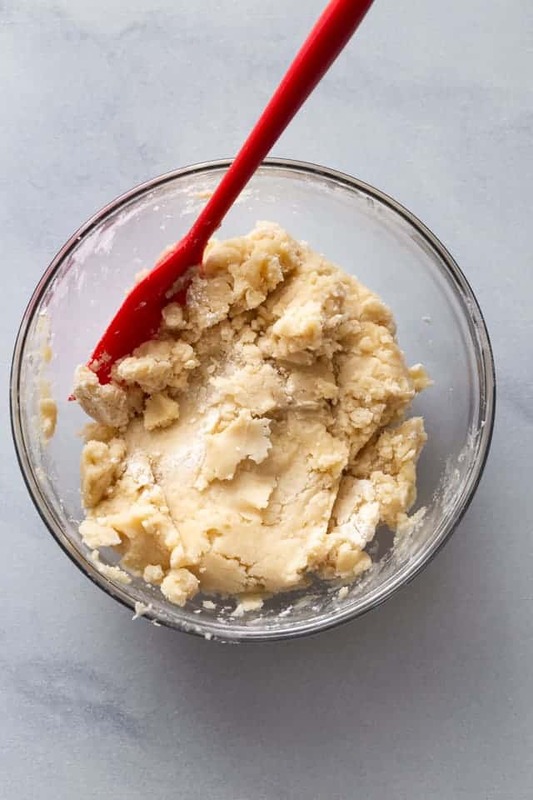 You should have a cookie dough like texture. Press the dough into the bottom of the pan and sprinkle the top with brown sugar. The sugar will harden as the crust bakes and this helps prevent the filling from making it soggy. 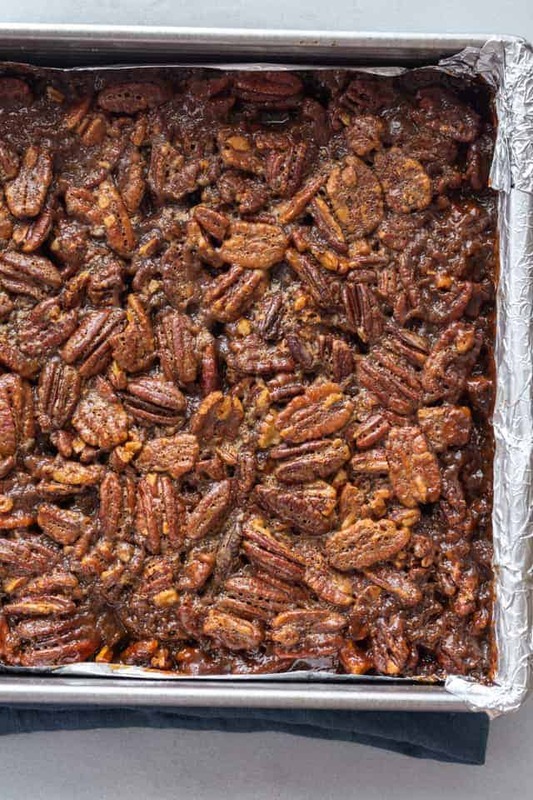 The pecan pie bar filling is super easy to make. Just whisk all the ingredients together then fold in the pecans. 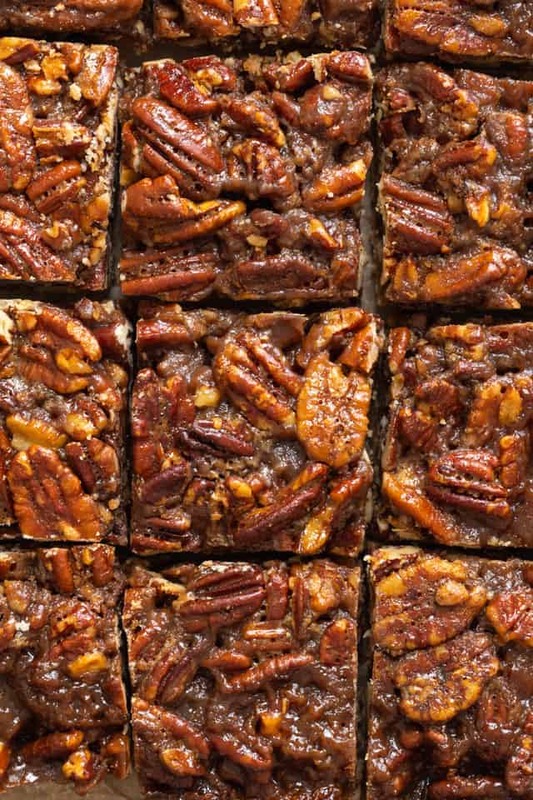 I like to toast my pecans beforehand so the flavor really shines in the bars. Spread the filling over the baked crust and bake the bars until the filling is bubbly and golden brown. I find that it takes about 30 to 35 minutes for them to bake in a 9-inch square pan. These bars are thick! If you want thinner bars, bake them in a 9×13-inch pan for 20-25 minutes. Line the pan with foil to make it easier to remove the bars. Allow the bars to cool to room temperature before trying to cut them. Adjust oven rack to lowest position and heat oven to 375°F. Line a 9-inch square pan with foil, leaving a 1-inch overhang. Lightly spray the foil with nonstick spray. Whisk the flour, sugar, and salt together in medium bowl. Add the melted butter and stir with a silicone spatula until the dough starts to come together. Use your hands to combine the dough until no dry flour remain. The dough should hold together when squeezed. Evenly scatter pieces of dough over the bottom of the pan. Press and smooth the dough into an even thickness. Sprinkle the brown sugar evenly over the surface of the dough. Bake for 15 minutes, until lightly golden brown. Whisk the sugar, corn syrup, melted butter, heavy cream, vanilla, and salt together in medium bowl until smooth, about 20 seconds. 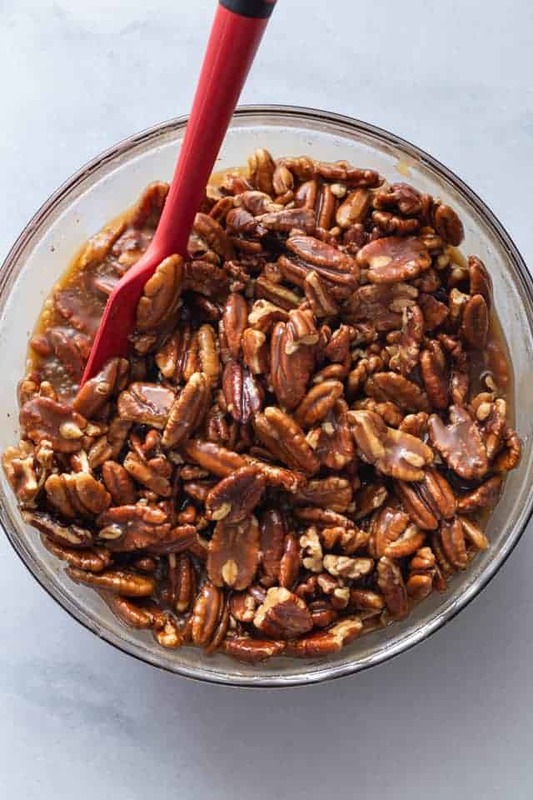 Whisk in the egg, then fold the pecans into sugar mixture until evenly coated. Bake for 25-30 minutes, until the topping is rapidly bubbling across the entire surface. Transfer pan to wire rack and cool completely, about 1 and 1/2 hours. Use the foil overhang to lift the bars out and transfer to a cutting board. Cut into 16 bars. The bars can be stored in the refrigerator for up to 5 days. You can freeze the bars for up to 3 months. Thaw overnight in the refrigerator. You can easily toast the pecans in the oven. Spread them in an even layer on a rimmed baking sheet and bake at 350°F for 8-12 minutes, until nuts are slightly darkened and fragrant. 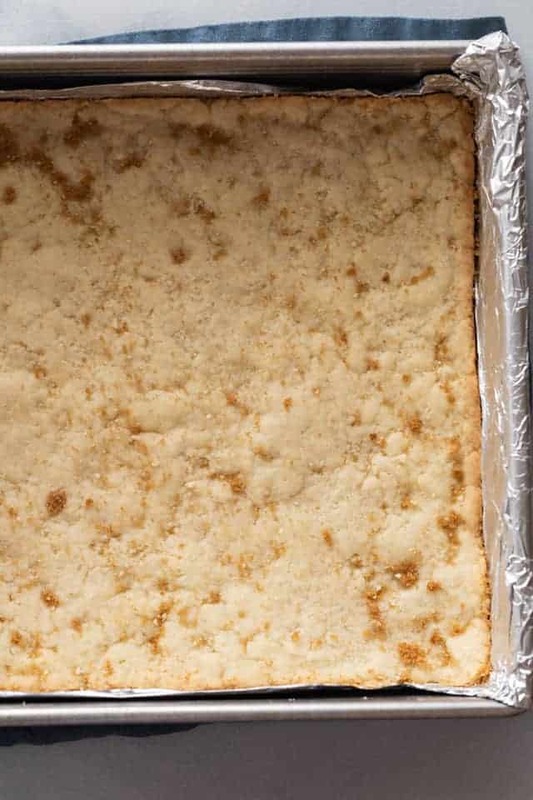 If you want thinner bars, you can make this recipe in a 9×13-inch pan. Bake the crust for 15 minutes. Then add the filling and bake for 20-25 minutes. I love how thick the pecan pie bars are!